Compact. It was a compact summer’s night. A good number to split up nicely and tour some of the world’s weirder places; Tokyo, the 7 Wonders, Hamburg, the Wild West, the Catacombs and Mice World – and I don’t mean Disney even if Sean sounded like he was part of a Disney comedy, when he wasn’t eating that was! Enough. The reports are in, off… we… go…. Neil committed suppuko glory by going into Tokyo and staying until the bitter (and very quick) end. (it seems that even the super powers of Japanese B movie monsters are not beyond the reach of capitalism). Paul then bought something that let him do untold damage, mainly because Andy was next and he couldn't resist the temptation to buy it up, thus Paul protected himself from losing his 'no damage to me' power. Dominic, James and Andy swapped big blows and killed each other off. Paul had really a really good position at the end and was confident of wiping Philip out until he realised that Philip had 17 points with enough cash to buy another card which took him up to 20 points and claim victory. Tom had promised to turn up at 8.30 so the first 'real' games of the evening was selected on the basis that it'd be over by that time and Tom wouldn't have to wait before joining in with the fun. As it happened, Tom was early and the game lingered, so he had to wait after all. Being a solicitor he'll appreciate our intent though. Fresh from kamakazie in Tokyo, Neil decided to arm up and caused much of the table to get big guns in order to protect themselves / teach him a lesson (delete as appropriate). Paul's strategy was to get as many straight victory points as possible. Andy, James and Dan went for a bit of everything (including weapons of mass destruction). James, Neil and Dan all did pretty well on the wildcard front when it came to science cards, meaning that their scores were bumped up nicely at the end. James and Dan seemed to end up with loads of money too, mystifying Paul who was fairly broke for most of the game and what money he had was donated to Andy as opposed to cash rich Dan. James had to explain to Neil that he couldn't construct the same building twice. That was at the start of the game and Neil hadn't played before. Fair enough. James took a much bigger delight, when counting up scoring cards at the end, in gloating that Paul had neglected this rule too and that he'd build 3 duplicates, so he'd need to surrender them with no points. He then went on to state that even with those building that James razed to the ground, he would not have won. The spoils went to Dan, with all his military might, money and sciencey stuff. 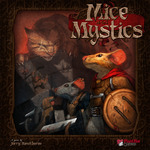 Another Wednesday evening, another game of Mice and Mystics, although Sean and his friend Kyle (?) replaced James and Alex. Although Sean and Kyle had never played before Dominic decided we'd try Chapter 3 as he was bored with earlier chapters. He had completed Chapter 2 successfully on an earlier occasion, apparently. We started with 1 skill each and our starting equipment. Kyle took Ned with Thundersqueek and Sean took Filch with a skill allowing him to take an extra action for 2 cheese. I took Tilda and the First Aid skill. Dominic took Maginos and Chain Lightning. Chapter 3 sees the mice venture back into the castle searching for more information about enemy plans. For some reason we don't have to cross the courtyard but start under the kitchen, where we easily fought off 5 Greedy Roaches, Filch earning the Roachmaster title due to being ahead of the roaches in the initiative order (so no defence for them) and his skill allowing him to attack twice. While Filch was killing the roaches we did some searching, finding some disguises and a useful +1 Lore helmet for Maginos. We then crawled up into the kitchen, where we successfully attracted the attention of the maid and killed off the rats. We also found a Grape and a Dinner Fork before walking into the Dining Room, where, disguised, we took part in a game of chance with half a dozen rats. The odds were stacked in the rats favour, so we lost all of our cheese, but not before 3 rats had been persuaded to exit. The remaining 3 rats were easily dealt with but the last one managed to attract the attention of Brodie, who promptly pounced on the chair, attacking 3 mice there and knocking out Ned. Filch was able to get in a wounding blow, choosing to prevent Brodie chasing, but then Brodie pounced on him, knocking him out as well. For several turns the game hang in the balance as Brodie repeatedly pounced on Tilda, who just about managed to defend and heal herself, while Tilda and Maginos failed to damage Brodie. Finally a powerful swing of Tilda's mace penetrated Brodie's fur and the cat fled- earning Tilda the Catmaster Token. We now descended into the Tunnels below the Dining room, where we fought off several roaches, a centipede and (following a surge) a spider. On into the next set of Tunnels. Some of us fondly hoped this was the final tile, but Dominic explained we would need to flip it again to reach the Library. Why we couldn't have gone there direct from the Dining Room I don't know. Anyway, these tunnels were defended merely by Rats and we saw them off easily, even though they ambushed us (an unlucky Search). Oh, and Ned had a vision which meant we moved the chapter end marker up one. At some point Filch had levelled up, gaining the ability to choose 1 card from 3 when searching. Unfortunately, Filch repeatedly failed search rolls so this ability was of very little use (one time he was able to use it and he found nothing of any interest). Ned also levelled up, taking a skill that allows the spending of a cheese to roll an extra die in attack. He also found some fishscale armour. Tilda found a useful potion which could cure a mouse of all wounds and any unfavourable statuses. We entered the Library to find Captain Vurst and 5 elite rats staring down at us from a desk and a bookshelf- all with ranged weapons. Maginos launched the Grape at the desk with the Dining Fork but failed to damage any rats. Ned searched, finding a scroll which cured Filch's wounds, and charged towards the desk. Tilda also charged towards the desk, having first launched Filch onto the bookshelf with the Dining Fork. Filch performed admirably up there, killing both elite rats, but then we realised he had no way to get down. So he was busy searching- and not finding anything as usual. Meanwhile the rest of us were tackling Captain Wurst on the desk. Maginos singed his fur with a powerful Chain Lightning and Tilda dealt the final wound with her Mace, ending the scenario. After rolling dice and swapping cards, the logical progression is obviously to unwrap the index finger and indulge in some flicking fun. 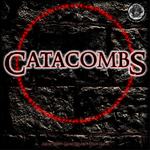 Catacombs allows players (Dan and Paul) to flick / crawl their way through a dungeon controlled by a dungeon master (James). Paul's not normally into the fantasy games, but the temptation to flick was too much, and so fighting the skeletons, flames spirits and the big nasty dragon was on. Of course, when I say 'fight', the implication is that it was at least fairly evenly balanced, with some skeletons being hit, roughly in proportion to some of our heroes. Alas 'twas not to be, as Dan's flicking skills were questionable, and Paul's worse. James occasionally looked up from him iPad to administer a killer blow and not once was he seen to have fear in his eye. Paul and Dan bumbled through, mainly pushing their missiles and melee shots harmlessly past the evil monsters. They did manage to get to the end of the game, only to be severely pommelled by a dragon, but it is quite likely that a more ruthless opponent than James wouldn't have let them get to the corner shop. An odd one this, in all the right ways! A cracking tile placement, worker placement, resource management game about the settlers in Western US, designed by two Finns no less. Tom took Andy and me through the rules and we were off. Over eight seasons you collect and place your tiles to grow your ranch, you then send the dudes out to farm, mine and generally work hard for you. Next the head honcho pops into town where he may sell some of the resources farmed or pick up some more, hire more dudes, arrange to build another house, some barns or other improvements. Then, not only do you need to feed your dudes but you need to keep them warm too. Andy had a fetish going on for wood whilst Tom and I seemed to be trying to do the same things although I went first in the play order and still didn’t manage to compete! Both of them did well picking up improvements that negated my dude and coin collections. Tom showed us how to construct some excellently fenced fields despite not having as many dudes as either Andy or I had. 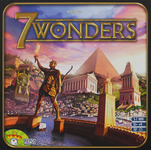 An excellent game, and very quick too. A bit of player interaction and with five different scoring opportunities it proved important to do well in all of them to win the game. Final Scores; Tom – 26, Andy – 24, Neil – 21. 10.30; time for a quickie, except nothing is obvious. Can we do Feld’s homage to warehouses in Hamburg in super-fast time? But of course! I ran through the rules for Tom and Andy who had played once before and off we went. Damn them both for going after my bids. So I walked away in round one and starting collecting coins instead. Tom picked up some fine moustachioed firemen and Andy was off on the contracts. In the second round I secured the first of my four offices, but the others progressed nicely with more contracts and sellers. Andy snuck in a fire fellow just before the first fire and then blow me down if the second fire didn’t happen almost immediately and I was 6 points adrift, costly as it turned out! The boys picked up a lot of goods and ships, selling the goods (probably not in accordance with the rules but hey ho!) and fulfilling their contracts. I managed to get the Bank, the Harbour and some late firemen but not enough. We also neglected to remove some of the cards so we had an odd end with just the 4-point fire happening; I’d escaped the 3 point one! Tom, cool as you like, with his completed contracts and at least half of the firemen in tow, strolled home comfortably.